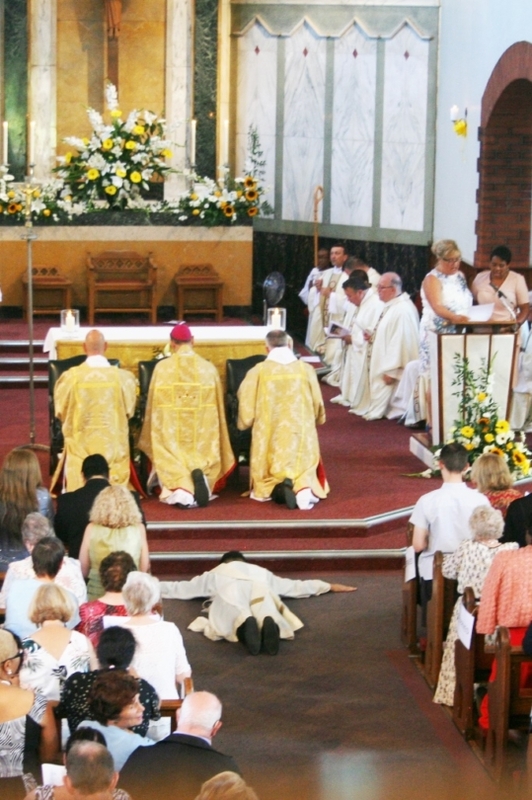 In a very special occasion for the parish of Holy Family, Dagenham, Rick Fernandez was ordained a priest at the end of June. Rick studied at the Beda College in Rome and became a deacon last July in Dagenham. More than 300 people, including 40 priests, were present as Bishop Alan Williams sm, the Bishop of Brentwood, ordained the diocese’s newest priest on 30 June. In his homily Bishop Alan asked the people listening to think about whether there was a gap in their life? Was there something missing? “That something may be the call you need to dedicate themselves to the Lord in vocation to Priesthood and religious life,” he said. The ceremony was followed by an open reception in the grounds of nearby St Joseph’s Primary School. Fr Rick has been serving in the parish of Holy Family for the last two years: he was ordained a deacon last year. Parish priest Fr Stephen Myers, who himself celebrated 25 years of ordination this year, had some words of advice in his sermon at the new priest’s first Mass the next day. Read the full homily here. Homily by Fr Stephen Myers for newly ordained Fr Rick Fernandez’ first Mass. The supreme privilege of being a priest is to walk the journey of faith with those that you come into contact, the privilege of seeing them develop, seeing them change, seeing them enriched, seeing them supported.